Tying Head: This is a completely winter style and can be worn with formal wear and evening gowns. 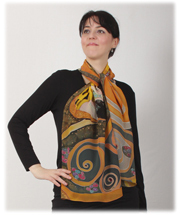 Popular in the 1960’s, this style has made a comeback through handmade silk scarves with intricate as well as simple paintings. Undercoat Style: This is completely formal style and is normally worn with coats. Dark and muted colors highlighting abstract painting go really well for this style. Shoulder Wrap: The shoulder wrap is a style that will never go out of fashion. 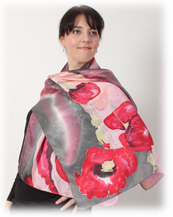 It is a perfect style for hand painted silk scarves because it will not only let others see the entire painting but also offer warmth to the upper body on cool evenings. It is considered to be a casual style. Head Wrap: Who said silk scarves for women could be worn around the neck and shoulder only? A smart head wrap not only works as a headband but is also considered to be an elegant way of highlighting skin tone and beautiful hair. There are two other styles that are similar to the head wrap and they are the hijab style and the gypsy style. 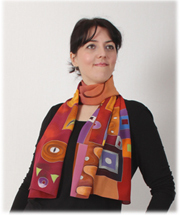 In this style, the painting on the silk scarves is highlighted. Ascot Knot: This is one of the most common styles of wearing handmade silk scarves. Tied around the neck with a knot, it adds an element of sensuality and also brings an exotic value to the wearer.